Mumbai, December 2014:It’s time to end your year-long wait for swoon-worthy dresses, as AND is back with an all-new edition of the much-awaited-AND Dress Fest A/W 2014. 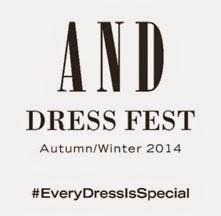 Celebrating fashion which outlives trends and time, this year, the AND Dress Fest is, all about commemorating your love for every dress that, evokes a surge of nostalgia, about a memorableevening, a momentous day at work, or a ‘special someone’. The AND Dress FestA/W 2014 campaign- #EveryDressIsSpecial-offers you, awalk down the sartorial memory lane, where it’s all about you, your favorite dress and that unforgettable occasion.So, gear up to celebrate great memories and milestones, as you create many more, with the special edition of AND Dress FestA/W 2014, starting from 4th December 2014, across all AND outlets in India. AND Dress Fest, makes ‘every dress special’, as it offers a wide range of eye-catching, trend- setting, and above all, wistfully memorabledresses, to make sure you stand out at your special occasion. Be itan impromptu brunch with your girls, or that much awaited romantic dinner date, a get-together to celebrate a promotion at work, or a surprise birthday party for your BFF- there sure is, a dress for every occasion. The AND Dress Fest A/W 2014 collection, ranges from versatile sheath dresses to fit & flare dresses, from fairytale inspired cape dresses, to maxi dresses with lace inserts and thigh slits. Draped in sheer georgettes, splendid velvets, and textured knits, the collection is dipped in autumnal hues of dreamy corals, flaming reds,striking fuchsia, deep wine to shimmery silver and gold. Each style has been stylishly curated to ensure, that the dresses don’t just look good, but feel great as well- leaving behind a glorious memory of the occasion they are worn for. Launched in 1998, AND was the first Indian brand to offer urban Indian women, global styles that suited their silhouettes. AND offers, a chic collection of contemporary western-wear, which comfortably combines formal and evening wear. The brand has evolved to keep pace with changing lifestyles and the ever evolving sartorial choices of the modern Indian woman. The AND woman, is stylish and confident, speaks her mind and wears her attitude on her sleeve. She represents the new age, multi-tasking woman, who seeks versatility in her everyday fashion choices. Presently, AND is retailed through over 300 points of sale, which include 52 exclusive stores, and 260 established multi-brand lifestyle formats like Shoppers Stop, Lifestyle, Central, Kapsons & Pantaloons.